- The Slingshot Knockdown Can game is to knock down all the cansusing slingshot & balls. - When all cans fall down level willcomplete. - If you throw all ball without fall down cans will levelfailed. ★ How to Play? - Touch on the screen and pellet-bow thenmove to aim and then release. - Limited balls to knock down allcans. - You can knock down all cans, you win level other wise gameover. ★ Features: - Addictive 50 gameplay levels. - Amazinggraphics,sounds and user friendly interface. - Simple one touchcontrols. ★★★YOU CAN DOWNLOAD NOW SLINGSHOT KNOCKDOWN CAN GAME FORFREE!!! - Are you ready to be a shooting expert and shoot bottles. - BottleShoot 3D is about shooting as many bottles as you can in limitedtime duration.- The 3D effect of the game looks so realistic.-Complexity of level is getting high as your level will up.- BottleShoot 3Dt game to make you feel like an expert professionalshooter.★ How to play?- Aim and hit the bottle, Shoot Bottlesprecisely.- You can use joystick for left & right to shoot morebottles.- You only have a limited amount time so don't missbottles.★ Features:- 40 action-packed levels(Add new levels comingsoon).- Select different guns.- Addictive bottles and shootingobjectives.- Limited time period and bullets.- Amazing shootinggame play control.- Realistic sound of broken glass.- Easy tocontrol.- It is free.You can download Bottle Shoot 3D for free.!!! ★★★WELCOME TO BALLOON SHOOT GAME.Balloon Shoot is a simple archerygame where you have to pop balloons using the bow & arrow. Playwith your favorite shooting game. Enjoy the best archery game onthe market.If you want to score more and clear level, then youshould be a good shooter or else you cannot clear the level. ★ Howto Play?- Simple touch the left of the bow to launch the arrow.-You can shoot more balloons and get more score & clear thelevel.- You can shoot BOMB and shoot more balloons.★ Features:-Amazing 50 challenging levels.- Realistic physics simulation andsound effects- Realistic animations.- No time limit.- Easy andprecise archery controls.★★★YOU CAN DOWNLOAD NOW BALLOON SHOOT GAMEFOR FREE!!! - No Lag in playing slither worm.io game.- Play now slither worm.iofor new addictive action game with grow your snake big and long.-While playing slither worm.io game if your snake’s head touchesanother snake, your snake will explode and start over again.- Yourgoal is become the biggest and longest snake to another player.★How to Play?- Play with joystick to move snake left & right.-Use turbo speed button to to run faster your snake.- Eat dead snakeglow light dots to grow. - Don't run into other snake.★ Features:-No Lag, No performance issues on any device.- Smooth game playcontrols.- Turbo Speed Effect.- Amazing background theme withdifferent snakes.You can download now slither worm.io game forfree.!!! ★★★The Best Knock Down game on Market! - The goal is to knock downall emoji boxes using slingshot and emoji ball.- When all emojiboxes fall down level will complete.- If you throw all emoji ballwithout fall down emoji boxes will level failed. - It has manyamazing unique and interesting levels.★ How to Play?- Touch onemoji ball and pellet-bow then move to aim and then release.-Limited emoji ball to knock down all emoji boxes.- You can knockdown all emoji boxes, you win level other wise game over.★ Features:-- Amazing & challenging 50 different levels.- Smooth &easy game control.- HD UI and graphics.- it's free game.★★★YOU CANDOWNLOAD NOW KNOCK DOWN GAME FOR FREE!!! Movie Poster Maker.Movie poster Maker is a best photo editor application.Capture a new image with your camera and apply an amazingphotoframe to it.Create your own photo posters.More than 15+ different movie poster frames for any picture.Amazing effects and you will stamp the best poster movies withyourphoto. ★★★WELCOME TO FARM CITY.- Start your career as farmer & learnthe secrets lying beneath the farm business.- City Farm in you cando lots of farming things such as building farm factory and town,dairy farming, fish farming, farm hay and goat farming, etc. - Youcan imagine a story by maintaining factory township along with thecity.- Decorate your own lush farmland in farm city game.★ How toPlay?- Food Crops: The instruction will be provided to players forthe tillage sowing of food crops and harvesting of the same.-Farming: The players will get guidance to purchase seeds, buildshelter for farm and livestock.- Fruits: The agricultural andlivestock revenue will be more from the purchase and care ofimproved seeds.- Production: Development of workshop in the cityusing items from crops and livestock and supply to the market forconsumption.- Players can extend their farming area and increasequantity of livestock by performing well in cultivation and earningrevenue from selling of farming and livestock products.★ Features:-Create your own farm city then grow and customize it.- Harvestingcrops, rice, nut, haricot, corn- Building products in yourfactories that have a lot of machine.- Trade the product such asfresh goods , crops, milk, with friends & neighbors customers.-Addictive & entertaining game.- Amazing different missionquests.- Grow domestic animals and establish a dairy farm.- Alltools are easier to control for managing the farm.- You will beable to organize a newly country farm business and village.★★★YOUCAN DOWNLOAD NOW FARM CITY GAME FOR FREE!!! - The best of army and military training game is here to enjoyIndian army training duty.- Military gun shooting training and armyground forces in one game.- Coach your superior life in the exhibitfitness with physical and mental training.- It’s not easy to becomesoldier as national guard.- Clear obstacle course across differentarmy posts terrain like dense forest, arctic snow and hot desertfield.- Prove your skills while competing with the forces of USA,Russia and Pakistan to make the State proud, So get ready.★Features:- Real military school obstacle course.- Realisticmilitary training with swimming, jumping, stealth, rolling.- Battleagainst world’s best military forces like USA, Russia, Pakistan.-Amazing training academy environment with HD graphics- Smooth &intuitive game play controls.- Challenging training missions. -Play as real trainee cadet to test your skills.★★★You can downloadNOW INDIAN ARMY TRAINING game for free!!! More Than 50 Million Downloads! 36 Unique and Interesting Levels!Physics based Game! 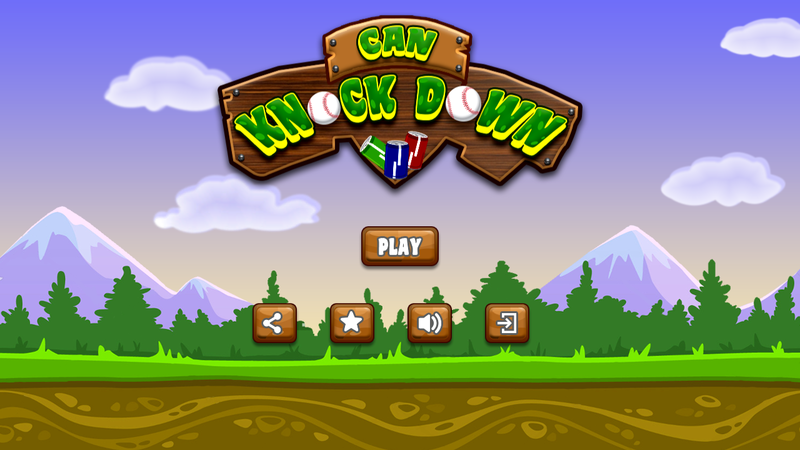 Knock Down is a game of knock and down all theboxes standing on some floating platforms with Slingshot and AngryBalls. To help in aiming there is a aim trajectory line which willpop out when you target the boxes. This is a level game. There are36 unique and interesting levels. You need good logical and aimingskills to complete any level. As you move to higher levels you willfind more difficultly in completing. You can also say this, aphysics game because all things are controlled by physics. You canalso zoom in, zoom out and move the game scene in each level in alldirections to see close look. Enough description! Now download andenjoy this interesting World. - Play Slingshot Knockdown Bird game with challenging &addictive gameplay levels.- This game is to knock down the birdsusing a slingshot and birds.- To complete a level you have toknockdown all the birds using your precision skills and logic.- Ifyou throw all birds without fall down birds will level failed. ★How to Play?- Touch on the screen and pellet-bow then move to aimand then release.- Limited birds to knock down all the birds.- Youcan knock down all the birds, you win level other wise game over.★Features:- Addictive 50 gameplay levels.- Best graphics,sounds anduser friendly interface.- Easy one touch controls.- You candownload now this game for free . Real Catapult Castle Crush is a Latest Free Arcade Game withRealistic Physics!! !catapult adventure is captivating game, whereyou have to knock out evil knights using a catapult. Play catapultcastle crush and enjoy the tower defense and strategy mechanismwith role playing (RPG) elements. Catapult is war game that takesyou back in time of medieval wars in a hostile scenario. in thisfighting game use catapult and help the stickman to defend hiscastle from the siege weapons of the rivals.Crush enemy castles,military mechanism and siege towers to complete the missions. ThisCatapult Real Challenge has a simple intuitive control and verysimple to do this. Just tap on screen and pull the charge catapultand select the tension force. Simply drag and drop your finger tolaunch the projectile into the enemy.Use catapult, bow, arrow andspear to fight but don’t forget to use all your fighting skills todefeat each enemy standing in your way. Check different ammo foryour catapult including bombs, stones and fireballs. Become realmedieval stickman hero and use all weapons wisely on each level oryou are never going to pass it. Use fewer moves and get high scorefor each successful struck rival.If you like Arcade and casualgames or medieval war games, then you will love Catapult RealChallenge. DOWNLOAD now, take a breath, aim the target and crushdown rival castles. Enjoy endless fun and complete all challengingtasks.Slingshot King Features:Real Time Arcade GameWonderfulGraphics and Multiple Fighting Location ScenesThe game has lots oflevels and types of shells for catapult.Completely free CatapultAdventure gameHave a Good GameThis game is free to play, but itcontains items that can be purchased for real money and may containthird party advertisements that may redirect you to a third-partysite.If you like Catapult Real Challenge, please rate and give yourfeedback for further improvement of the game.